It was bound to happen. He’d had a decent run, though decent is, sadly, a relative term. Eight days without a seizure. Nothing compared to the seventy-eight-day stretch he had some years ago when he was on high doses of three anticonvulsant medications, but that regimen made his behavior intolerable for everyone and reduced me to tears on most days. My latest strategy for improved seizure control was to double Calvin’s bedtime dose of THCA cannabis oil eight nights ago—the oil my gut says is having the best effect on Calvin’s seizures. Since then, he has slept quite soundly, and instead of having one to three seizures in the middle of the night, the isolated seizure didn't arrive until 5:30 this morning. Hesitant to over-drug him by employing a THC cannabis rescue tincture to stop the convulsions, I passed an open bottle of lavender oil under his nose and the spasms stopped within seconds. Who knows if it had anything to do with the lavender, which contains linalool, a relaxing terpene being studied for its use as an anticonvulsant, or if the spasms were about to stop anyway. But I figure it couldn’t hurt. Regrettably, November and December were bad months for Calvin with regard to seizures; he had thirteen grand mals in that time and at least twenty partial seizures. A year ago he was having three to five grand mals each month and zero partials. I can’t finger the exact cause of the uptick because there are so many variables at play—puberty, benzodiazepine withdrawal, subclinical illness, outgrowing doses. I have to remind myself, however, that Calvin is on 92% less benzodiazepine than he was two years ago, and two-thirds less than last December, not to mention being in an active benzodiazepine withdrawal, which can trigger seizures even in people without epilepsy. Calvin's current antiepileptic regimen consists of what I think are modest doses of THCA and CBD cannabis oils, a small amount of clobazam and a moderate amount of Keppra—a far cry from high doses of four-drug cocktails plus rigid dietary therapy. I'm heartened by what I've seen since we doubled Calvin's bedtime THCA oil. He's been very happy and calm several days in a row, has had great balance, is sleeping soundly and not waking until nearly six o'clock. 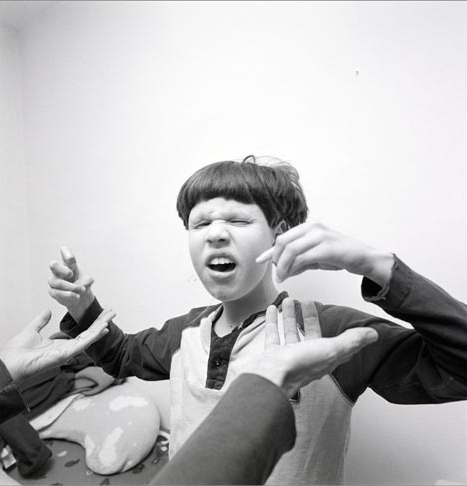 We've seen far less of the incessant finger snapping and the manic episodes you see in the photo below, which usually begin occurring around day five and gradually worsen up until the night/morning of each seizure. My hope is that the THCA has a soothing effect overall and that the increased bedtime dose will reduce his seizures while we continue his painfully protracted benzodiazepine withdrawal which, my gut also says, has been easier on him because of cannabis. So tonight, New Year's Eve, I'll be toasting to a better year for Calvin and for everyone.